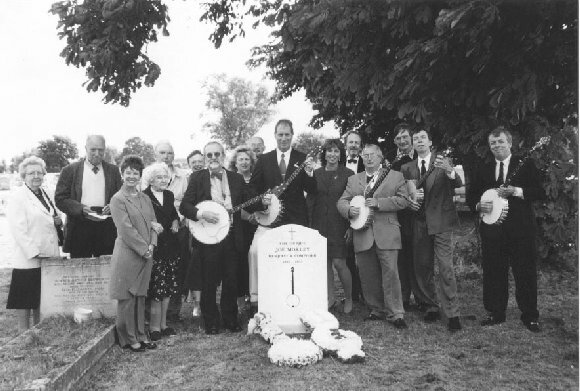 Here is a photograph of "History in the Making", when "The International Banjo Circle" placed the first ever headstone on the grave of Joe Morley. What this photograph cannot fully convey is the poignancy of the moment, being present on the very day, sixty three years after Joe Morley was buried in that actual spot. Being there to see his headstone graciously unveiled by Sally Murrell. To be part of a group who came together on that unique "one off" day, for the first and only time. you see only smiles (my expression is one of relief!) as this was a joyous occasion, having put right a long overdue wrong to a great man and rejuvenated interest in his work. We are very grateful to Mike Redman , ably assisted by Ann, who so expertly recorded the occasion in photographs and video. Douglas Rogers, accompanied by Richard Ineson , gave a masterly, and very fitting rendition of Joe's beautiful "Rose Leaves". There can be little doubt that Streatham Park Cemetery has not heard the like, particularly with "Banjo Frolic" as a "group played" encore. Joe Morley's "Day" saw us assemble at Streatham in the cemetery car park under cloudy but sunny skies. Following a time for late arrivals, and the cemetery being a very large area, we drove to plot 34010 square 20. After a brief welcoming address, Sally Murrell unveiled the new headstone to warm applause. Our banjo-shaped wreath was graciously placed in position by Myrtle Torrence. The American Banjo Fraternity floral tribute was due to be placed by Dave Wade, sadly he was seriously delayed by car maladies, so Julian Vincent ably carried out this vital task, coupled with a brief but fitting address. Richard Ineson followed with finely crafted words on behalf of "Every Player and Admirer of Joe Morley's Unique contribution to the Art and Culture of the Banjo". The assembled company and South London Crematorium was then treated to some jolly good banjo music. Photographs had been taken throughout the ceremony, plus a continuous video and additional press photographs. Streatham, Clapham & Dulwich Guardian covered the event (having received our "press pack"). Having concluded our historic task, we did not hurry away, but as "The Joe Morley Memorial Lunch" beckoned, we finally departed, knowing that the task of providing Joe Morley's last resting place with a headstone had been properly completed. A relaxing and most convivial lunch followed at a nearby hostelry, a set menu of soup, roast lamb followed by apple pie and coffee (not forgetting the mandatory best itter) was just the kind of atmosphere and fair that I am sure Joe Morley would have enjoyed. After the terrible events in America of September 11th, my birthday, September 15th was "mission accomplished". Their excellent floral tribute of a treble clef was created by Joannas Plantique florists and received by me at the cemetery exactly on time. The ABF asked Dave Wade to lay their wreath and read a brief address. Dave was badly delayed along with his wife and Clive Hughes, when their car broke down temporarily at High Wycombe. Following Julian Vincent's fine job as Dave's substitute, the ABF address was given with great gusto by Dave during lunch and later when his party viewed Joe Morley's headstone back in the cemetery. I am delighted that the ABF were properly represented in such a tasteful and fitting way on Joe Morley's special "Day". Far from being humiliated, the advice note for the ABF's Fall Rally reads as follows: "We are planning a programme on Joe Morley and his music in honour of "The JOE MORLEY Memorial Celebration" and the placing of a stone on Joe Morley's grave in London. "The JOE MORLEY Memorial Fund" was officially closed on August 17th 2001. Not to be represented on September 15th was a serious omission on the part of "The Federation". Jackie Stephens does a great job in publishing their newsletter and general admin, but surely it was not asking a lot for one of their numerous "committee members" to be present? As far as "The JOE MORLEY Memorial Day (and lunch) was concerned, the events were as I had hoped , and more. Everything worked perfectly (apart from Clive's Range Rover!) and numerous letters I have received further confirm the opinion of those fortunate to attend. Dave Wade's help in publicising the Joe Morley project on the internet has been vital. In addition to detailing contributors, information about the fund, Morley's biographical details etc., we have included a dated list of all Morley's compositions with publishers and series numbering where possible. This enormous task was undertaken by Richard Ineson, who also wrote a full technical description of Morley's favourite banjo, the "Weaver". I contributed the illustrations. The internet site will receive updates on existing features plus any material pertaining to Joe Morley. Two regional newspapers received our "press packs" and carried articles on "The JOE MORLEY Memorial Fund". Streatham - Clapham & Dulwich Guardian covered the events in Streatham and published a decent article on our project, together with a group photograph. To coincide with September 15th, I prompted the "Stourbridge News" to publish a similar article on Joe Morley with the additional "slant" that Joe was born in Kinver, Staffordfordshire. I contacted a local Kinver historian, and parish councillor, who, understandably, knew nothing of the Morley connection. Since publication I have received telephone calls from several people who saw the article offering their help with researches into Joe Morley's early life. There can be no doubt that our "Joe Morley" project has enlivened a great deal of fresh interest not only in Morley's contribution to banjo culture but in the man's whole being. those who contributed funds were not just funding a piece of engraved white marble, they are a group who are now part of banjo history. Not only do these people deserve our appreciation and gratitude, they have finally righted a great wrong and have participated in and helped launch a unique banjo project that will continue to roll along and likely as not have far reaching benefit in the preservation and promotion of the art and culture of The Banjo.